It’s not fully dry yet, so I expect the colors to be somewhat lighter/glossier once it’s fully dry.Â It is lovely, though.Â And I was right – the garnet red/gold leaf beads are going to be gorgeous with it.Â I plan to stop by a bead shop over the weekend to see if I can find matching beads to fringe it with. 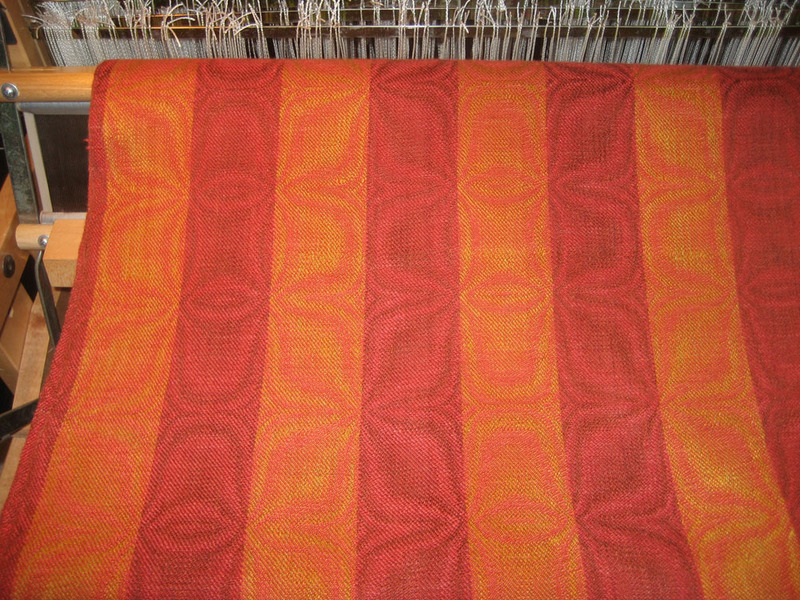 It does have some annoying skips in it, though.Â The problem is partly just that they’re there – this time the tension was even and well-done, so I can only attribute the skips to my own errors in weaving.Â The other problem is that I have no idea how to repair skips in a complex pattern in fine threads.Â With a pattern repeat of 600 threads, there’s no easy way to know what the correct pattern should be.Â I’m not even sure how to weave the yarns through without splitting threads. Oh well.Â Questions for the morning.Â For tonight I’m content just to admire it.Â It’s a lovely thing. Further pix once I get it hemmed, and the beaded fringe sewn on. Stunning! My colors, I just love it. it’s gorgeous, Tien, and I certainly can’t see any skips. hey, keep the bike upright, okay? I just read about the tracks. be careful, you.